As you might imagine, when you love food like we do at 63 we’re always on the lookout for ways to get involved in the industry. Scotch Lamb Weekend on 23rd and 24th August has been developed on the back of their hugely successful Wham Bam Lamb campaign and is being used to showcase their new campaign ‘Love Scotch Lamb’. The idea is to highlight Scotch Lamb when it’s at its seasonal best, showcase the versatility and ease of cooking, challenge the perceptions that it is expensive and difficult to cook and ultimately encourage more of you to choose Scotch Lamb to cook with throughout the week. Quite the challenge then, and a tough call when I’ve been known to struggle to put prime cuts of lamb on the lunch menu at a price I find affordable and fair. That said, I love lamb. It is my favourite Scotch meat and one I love to cook, serve and eat. And after my time spent on the Wham, Bam videos last year, I am even more passionate about helping the cause and getting it onto dinner tables across the nation. And so, for the eagle-eyed among you, you will have spotted that this Scotch Lamb weekend is now, hence the theme of this week’s blog. As if by magic, Frank, my butcher, from Yorkes in Dundee called me up a couple of weeks ago and talked to me about a new cut of lamb that he was experimenting with. It turns out Frank had been on holiday in France and had ordered a beautiful lamb dish that had, at the time, seemed ridiculously cheap for what he was getting. When it arrived he found a well presented rack, French trimmed but cut from the shoulder instead of the loin. It had all the great flavour of shoulder with the tenderness of the loin and he was blown away at how good it was. And so, just to make sure he had got it right, he headed back to restaurant again and checked it for taste and quality! What a great guy, all the research just for us! Now, there isn’t a part of a dead animal that Frank doesn’t know and he was able to work out exactly how they’d done it. 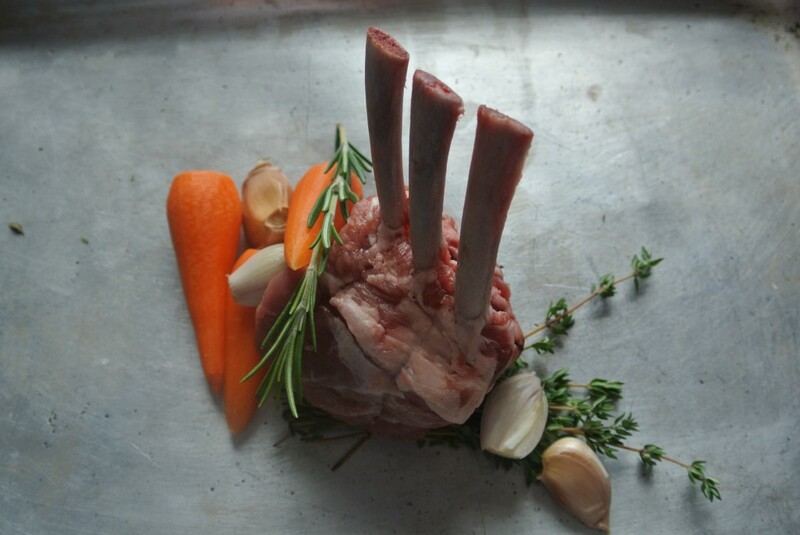 He got home, started the experiment and before long had this new cut ready – Rack of Lamb Shoulder. That’s when he called me up and asked if I’d step in and complete the experiment with some ideas for cooking it, best methods and timings. At the moment we’re the only restaurant being supplied this and I’ve been enjoying preparing it and getting it lunch ready. It’s fair to say that the price of lamb has come down this year – for many reasons – but you still get peaks and dips in pricing which is what makes this such a tough menu item for chefs pricing a menu. The fact is, that lamb is almost as seasonal as berries, with an abundance of delicious young meat in August, September and October and less readily available in February and March – it’s simple supply and demand. All is not lost though; as farmers begin to work more together and various groups supply at different times of the year, we can see the vastness of Scotland’s landscape offering up different breeds and flavours, one every bit as good as the next and the supply beginning to stretch all year round. Add to this mix, a diverse operation like Frank’s that supplies to restaurants, catering companies, the public and a wide multi-cultural customer base will be able to use the whole beast, nose to tail which helps him keep the price low for everyone. And this is exactly what Scotch Lamb want us to realise. Lamb doesn’t need to be expensive. Yes, there are prime cuts like every other meat but if you’re looking for something tasty for the dinner table then favourites such as shoulder and neck are always a huge hit. Your family will be delighted at a gorgeous roast, I’m sure. 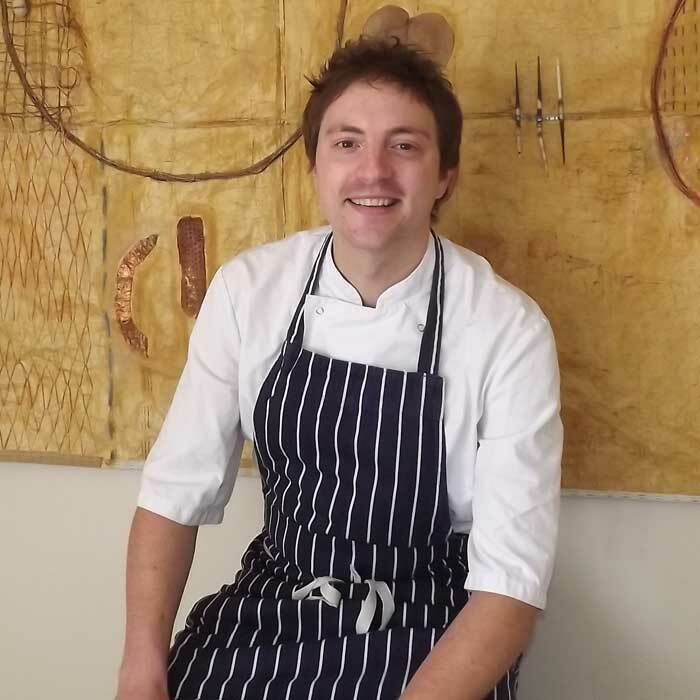 For me, in my style of restaurant I just can’t get the consistency I need with a roast and that’s why inventive butchers like Frank help me keep things interesting and at a keen lunch price point. Because you see, a proper Scottish butcher, like Frank, can adapt to the industry and its demands and come up with ideas to help all of us keep lamb on the table. A wee bit thought and ingenuity and we are chatting about a new cut and at the same time reminding ourselves of old favourites. This new cut of Frank’s though, because it uses the shoulder, is cheaper than a traditional rack and he wasn’t kidding when he said it was every bit as tasty. It’s perfect for our lunch menu or for your teatime meal. I’ve decided to cook it quite rare, which you don’t often get to do with the shoulder because of the toughness of the sinew. Sear it all over and hold in the crisp, grassy flavour and then roast it to medium before letting it rest. I’m serving it in the restaurant with grilled aubergine, rosemary and thyme and it is sensational! Come in and have lunch this weekend – order the lamb and enjoy your main course, with an amuse bouche and homemade breads for only £13.50. Well, we are having a bit of party for it after all!